I have a choice of cycle routes to Paddington. On autopilot I usually travel to Paddington via Ladbroke Grove and Westbourne Park. It is not an onerous route, traffic is not too heavy or aggressive and for the most part I can avoid the arterial channels of fat bottomed trucks and arse sticking motorists but coming back the canal route appeals. From St. Mary’s Hospital, where I had my physio review*, it is cobbly ride down to Paddington Basin to the unboxed cleanliness of the chrome and glass concourse of the Paddington Station entrance directly on to the Regent’s Canal. There is the coffee barge and the book barge and ordinary common place live a board barges. It is quaint. Sheldon Square is a hive of activity behind mirrored windows, canal side dining and drinking gently bubbling before the 5 o’clock boil. Then Little Venice the trefoyle junction where Paddington Basin, the Paddington Branch of the Grand Union Canal and Regent’s Canal intersect. Picturesque London, a tear drop of Amsterdam, now there is a dutch barge, cosy clutters of barges side tied and one or two houseboats asserting dominance. There is a ribbon settlement of barges end to end for a mile or two and cycling is theoretically forbidden so it is a judicious journey giving pedestrians priority. Then the cosy domesticity falls away and it is quieter, an eye in the storm of London. A breathe of fresh air and peace or a something more sinister depending on your perspective. My nature tends towards the latter and I am glad to be cycling; two hedge haired hippies shake their skinny hips and twined tied trousers to some silent music bracketing the towpath, a glassy-eyed youth with a can of Kronenburg loiters listlessly. And then Mr Grey Heron, teettering on this rock, struggling to remain motionless to catch his prey. A ungainly bird when launching into langrous flight more suited to a wide expansive of water. 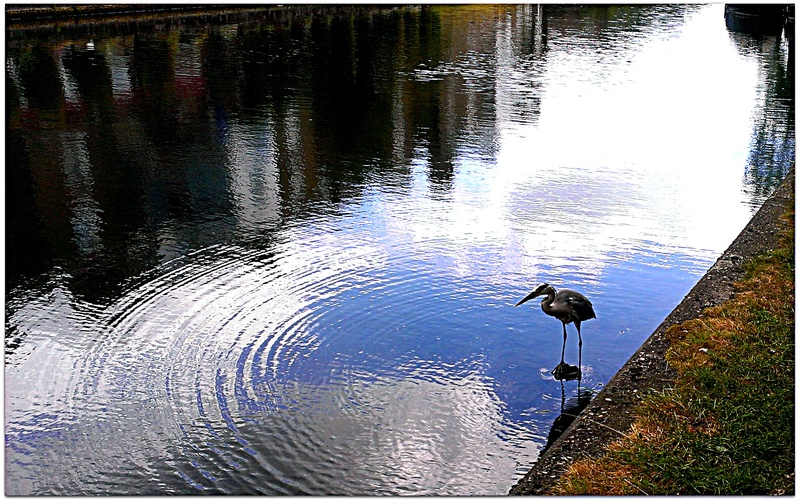 His wings seem to skitter each side of the canal as he flys away irritated by my attention. *I fractured my hip 18 months ago which led to 4 months effectively bed bound. Soft tissue healing is much slower. All hail & glory to the UK National Health System (NHS) and its unfailing support.